Connect your google plus account to get free 2000 coins. Use your free 2000 coins to upgrade your three active skills/power ups and level 1 for bounty hunter. Heals percentage of HP over time. Your ninja will automatically attacks all enemies encounter. Your ninja will bounce while slashing. You will be INVULNERABLE when using an active skill/power ups. Save your coins and get level 1 of attack speed. After all of your skills/power ups has been upgraded at level 1. You can choose what any skills/power ups should be level up first since all skills/power ups are very useful. Don't get any utilities as they are very costly and you can only use them once. 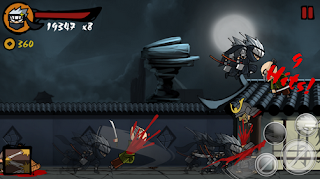 You can also get free coins by completing Ninja Revenge App offers. You can earn more coins for daily hunt, when you finish a daily hunt you will get coins. There is a time cooldown for finishing a daily hunt. Change your time/date, it is more practical to change your date by adding 1 day. The game will reset your daily hunt time. Open Ninja Revenge to make sure if it is working.